William Frederick Yeames (1835–1918), who died a century ago today, is one of the many painters who is now known by a single work: in his case And when did you last see your Father? (1878). As a history painter in the day of the Pre-Raphaelites, his career was something of an uphill struggle, and in some ways, it is fortunate that one work is still remembered. The son of a British consul in Russia, he was born in Taganrog, on the shore of the Sea of Azov, to the north of the Black Sea, then in the Russian Empire. His father died when he was only seven, so he was bundled off to Dresden in Germany to be educated, and to start learning to draw and paint. His family brought him back to Britain, where he received private tuition before travelling to Florence at the age of only 17. He studied there, and copied the Masters, before returning to London in 1859. In England, he formed what became known as the Saint John’s Wood Clique, with Philip Hermogenes Calderon, Frederick Goodall (1822-1904), and George Adolphus Storey, who are today even less well-known that him. At the time, though, his paintings had quite a decent following, and he exhibited at the Royal Academy from 1859 on. William Frederick Yeames (1835–1918), Hiding the Priest (1868-74), oil on canvas, 58.7 × 85.8 cm, location not known. Wikimedia Commons. 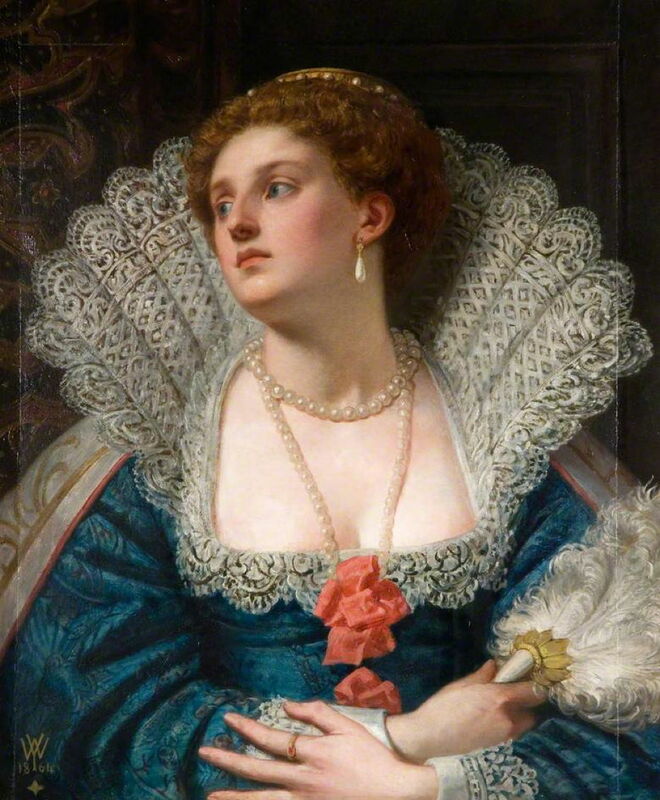 Yeames’ particular interest, and the basis for many of his best paintings, was the Tudor and Stuart period. In Hiding the Priest (1868-74), he shows a ‘priest hole’ used to hide Catholic priests during several purges which took place in the reign of Queen Elizabeth I. The room shown here is now known as the Punch Room, in Cotehele House, a superb sixteenth century manor house on the border between Devon and Cornwall, to the north of Plymouth, England. A priest is shown ascending into the hidden chamber by ladder, as one of the family, at the left, watches for the arrival of ‘pursuivants’ who pursued Catholic priests during a purge. William Frederick Yeames (1835–1918), For the Poor (c 1875), oil on canvas, 114 x 164 cm, Private collection. The Athenaeum. 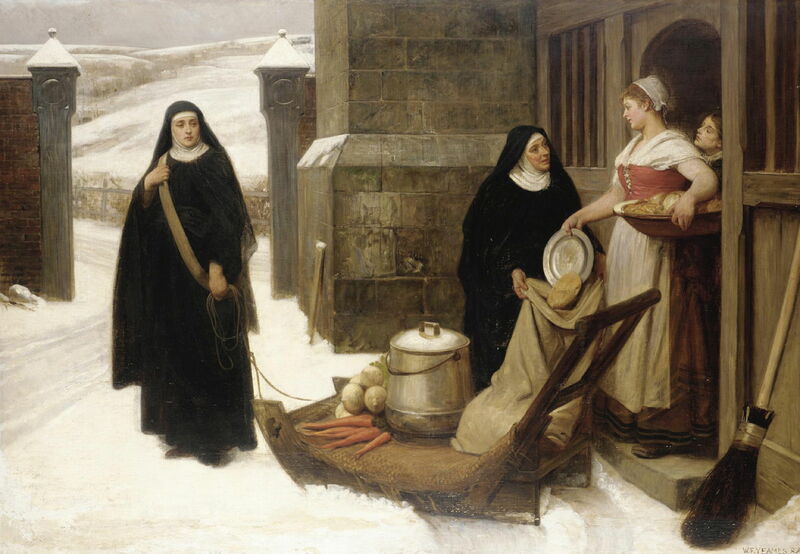 For the Poor from about 1875 shows two nuns collecting food door-to-door to feed the poor during a bitter winter, probably at the edge of Dartmoor, Devon. William Frederick Yeames (1835–1918), And when did you last see your Father? (1878), oil on canvas, 131 x 251.5 cm, Walker Art Gallery, Liverpool, England. Wikimedia Commons. Like most of Yeames’ history paintings, And when did you last see your Father? (1878) is plausible but imaginary rather than based on historical records. 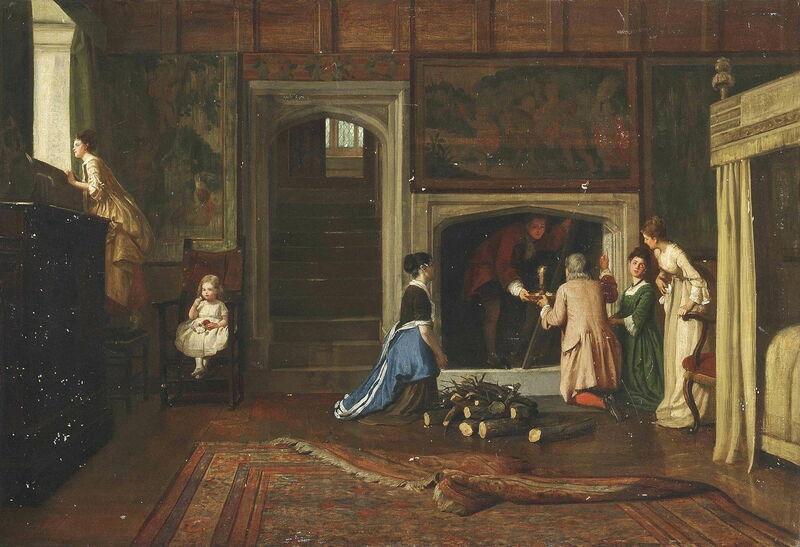 It shows a Royalist household during the English Civil War between 1642-51. The men present are Roundheads, Parliamentarians, who are trying to locate and capture the head of the household, the small boy’s father. The boy is based on Gainsborough’s famous portrait of The Blue Boy (1779), modelled here by the artist’s nephew. Although he is being questioned quite amicably if not sympathetically, the question put to him in the title of the painting exploits the openness of childhood in an effort to get the boy to betray his father’s whereabouts, an unpleasantly adult trick. Next in line is an older girl, who is being comforted by a Roundhead soldier, but is already upset. Their mother and an older daughter wait anxiously at the far left. Yeames was particularly fascinated by the strange story of Amy Robsart, shown here in his 1877 narrative painting of her. She was the first wife of Lord Robert Dudley, a favourite of Queen Elizabeth and allegedly one of her loves if not lovers. Elizabeth acceded to the throne late in 1558, and Dudley was called to court as her Master of the Horse. His wife Amy, née Robsart, did not follow him to court, and hardly ever saw her husband. 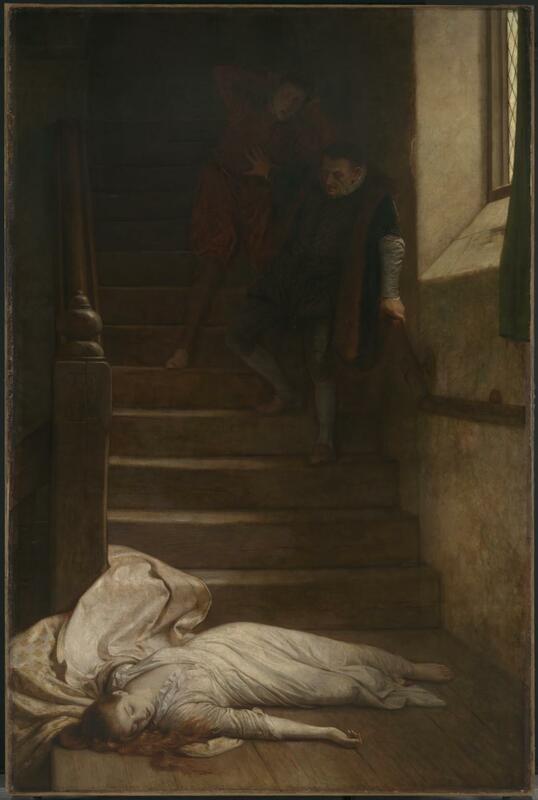 On the morning of 8 September 1560, when she was staying at a country house near Oxford, she dismissed all her servants, and was later found, as shown here, dead with a broken neck at the foot of the stairs. Although an inquest found no evidence of foul play, and returned a verdict of accidental death, Amy’s husband was widely suspected of having arranged her death. Speculation continues to this day. Yeames shows Amy’s body at rest at the foot of the stairs. In the gloom above, Anthony Forster, one of Dudley’s men, is leading his manservant down the stairs when they discover Amy’s body. The implication here is that Forster murdered Amy on Dudley’s orders, which is one of many speculative accounts. William Frederick Yeames (1835–1918), Amy Robsart (1884), oil on board, 76 x 63.5 cm, Wolverhampton Art Gallery, Wolverhampton, England. The Athenaeum. Later, Yeames painted this portrait of Amy Robsart (1884). 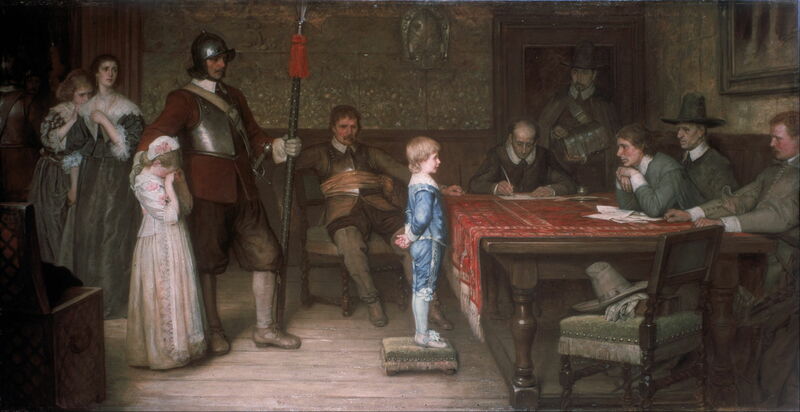 William Frederick Yeames (1835–1918), Defendant and Counsel (1895), oil on canvas, 133.4 x 198.8 cm, Bristol Museum and Art Gallery, Bristol, England. The Athenaeum. Towards the end of the nineteenth century, problem pictures became popular, in which viewers were encouraged to speculate over their underlying, usually melodramatic, narrative. Defendant and Counsel (1895) is one of Yeames’ several problem pictures, which would have been exhibited in London, and illustrated as an engraving in newspapers. 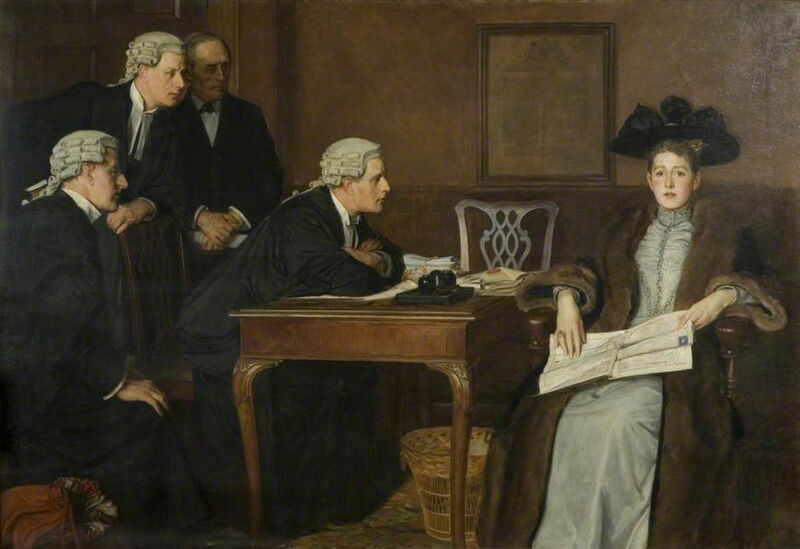 It shows an affluent married woman wearing an expensive fur coat, sat with a popular newspaper open in front of her, as a team of three barristers and their clerk look at her intensely, presumably waiting for her to speak. As she is the defendant, the viewer is encouraged to speculate what she is defending: a divorce claim, or a criminal charge? This also opens the thorny issue of counsel who discover that a defendant is lying, but still mount their defence in court, and may succeed in persuading the court to believe what they consider to be false. Like And when did you last see your Father? this may be an exploration of truth and the problems posed by it. Yeames died at the age of 82, on 3 May 1918, in the Devon Riviera resort of Teignmouth. And when did you last see your Father? was bought by the Walker Gallery in Liverpool shortly after it opened. A tableau of the painting has been in Madame Tussaud’s wax museum in London for most of the intervening years too. When it first came out with macOS Sierra, the full-on iCloud option of putting your Desktop & Documents Folders into the cloud was often a disaster. For many users, iCloud became an unseen hand which snatched their precious files away as fast as their internet connection could carry them. It only takes a few well-known examples of users losing control, or even worse losing documents, to put most of us off. the full Desktop & Documents Folders configuration, in which macOS and iCloud manage all files in those folders. The full contents of iCloud Drive will be stored on this Mac if you have enough space. Older Documents will be stored only in iCloud when space is needed. However, as I have reported here, that is not the way that it works in Sierra 10.12.6 on some Macs at least, nor in High Sierra 10.13.4, and whatever optimisation macOS is supposed to perform can be overridden by user actions, although not normally under user control. Given the rather opaque behaviour of these different variations, I have been looking at how they work out, with the aim of discovering whether the full Desktop & Documents Folders configuration is now worth considering, and how it works. This is, I believe, by far the most popular choice for iCloud users, as it gives the user most control, and works well with smaller iCloud capacities. If, like me, your main Mac has a 2 TB internal drive with over 400 GB in its ~/Documents folder, you only have 50 GB of iCloud storage, and you are still on a slow rural internet connection, this is the option which makes more sense. In theory, it should be irrelevant as to whether you enable Optimize Mac Storage provided that you keep ample free space on your startup volume: iCloud Drive should keep local copies of all the files that you put into the cloud, and never see any need to evict any from local storage. As there’s no way of evicting files using the Finder or any other tool bundled with macOS, most iCloud Drive users potter along with local and cloud copies of the files they move or copy to iCloud Drive. The exceptions seem to come with High Sierra, which can underuse local storage by evicting files from there even when there is ample free space. I discovered that one of my High Sierra systems checks its local storage quota correctly, but still evicts files which are not accessed often when Optimize Mac Storage is enabled. In the Finder, your iCloud Drive is shown as a special item in Favourites, and doesn’t exist anywhere else: it isn’t a shared item, a device, or a volume, but a special illusion of the Finder and GUI. As far as Terminal and the file system are concerned, your iCloud Drive is based on a folder/directory in your Home folder, in the path ~/Library/Mobile Documents/com~apple~CloudDocs, and the Finder and related GUI interface elements won’t let you past ~/Library/Mobile Documents; the only way to gain access to items in iCloud using Open File and similar gateways is via the iCloud Drive Favourite. Other folders exist in ~/Library/Mobile Documents, including all the app-specific folders or Containers, but the GUI effectively prevents you from seeing inside them, even as an admin user, unless you enter via Terminal. Except for some which are shown as if they were inside ~/Library/Mobile Documents/com~apple~CloudDocs even though they are not. For example, my ~/Library/Mobile Documents/com~apple~CloudDocs folder contains just five folders, but in the Finder that same iCloud Drive contains another dozen folders which are actually stored alongside com~apple~CloudDocs in ~/Library/Mobile Documents. This is all extremely confusing and thoroughly inconsistent. These inconsistencies worsen, particularly in Sierra. In the Finder, my iCloud Drive folder contains 17 folders from Automator to Word, which includes the Desktop and Documents folders from another Mac, and one folder that I created for my own use. In an Open File dialog displaying hidden items, there are 37 folders shown, including those for apps such as Mellel, which are not listed by the Finder even when set to show hidden items. In fact, Mellel has not one hidden folder but two, apparently with identical names. When listed using the macOS file system, ~/Library/Mobile Documents contains no less than 54 folders, and the apparently duplicated folder named Mellel turns out to be two folders with very different names, iCloud~com~redlex~mellel and DS2QH574BD~com~redlex~mellel, even though both are shown in the GUI has having the same name. F3LWYJ7GM7~com~apple~garageband10 format, which are not shown in the GUI at all, only in Terminal and the file system. It appears that the Finder and Cocoa hide and move folders/Containers on the basis of a ruleset similar to that above. When you do want to check the contents of any of these folders/Containers, this makes it thoroughly confusing and frustrating. These folders/Containers exist in local storage even when the files inside them have all been evicted to cloud storage. Files which are being stored locally exist as normal files within the folder/Container hierarchy, and to all intents and purposes are indistinguishable from normal local files. When a file is evicted from local storage, its place is marked by a stub file bearing a different name. This is formed by prefacing the regular file name with a stop/period to hide it from the GUI, and appending the extension .icloud. So the downloaded file named myFile.text is replaced by a stub file .myFile.text.icloud when it is evicted from local storage. However, the GUI never displays stub file names, only the names of the downloaded files, even when the file has been evicted. This can cause errors. For example, if an app uses a FileManager call to deliver the contents of a folder containing evicted files, the file names will be those of the stubs. If the app then calls for one of those files after it has been downloaded – perhaps triggered automatically by a GUI interaction with that file – the stub will have been replaced by the downloaded file, with its original and different name. The risk of errors is reduced by referencing the files by URL rather than path. However, that may in turn force a long wait until a file has been downloaded before it can be accessed. As such delays are peculiar to iCloud and their duration can extend to many minutes, catering for these behaviours properly in apps introduces an added layer of complexity, and ample opportunity for bugs. Dealing with files stored in iCloud is an even greater problem in shell commands and scripts. If a file had been evicted from local storage, it is no longer accessible through its original name, but accessing it through the stub name – which is what is returned by ls, for instance – returns the binary property list of the stub file, not the original. I know of no shell command which will force the downloading of files which have been evicted to iCloud storage, which could be used to ensure that there were no stub files in an iCloud Drive folder. My new MacBook Pro is an obvious candidate to use the full-on Desktop & Documents Folders option, as it has relatively small local storage (512 GB) and very little cluttering up its Documents folder yet. One trick worth thinking about is moving items which you don’t want given the full iCloud treatment into another folder before enabling this option. I created a folder ~/OtherDocuments into which I moved a large and complex folder of Xcode projects, for example. Once you have enabled Desktop & Documents Folders in the iCloud pane, macOS makes some rearrangements for you, whether you like them or not. The Documents and Desktop folders vanish from your Home folder, and reappear in iCloud Drive. All other devices which connect to that same iCloud Drive will then also see that user’s Documents and Desktop folders too, which can be a benefit, or a problem. What you then get is iCloud Drive, with its quirks as detailed above, and special rules applied to your Documents and Desktop folders, which are now also based in iCloud. The Finder now treats three items – iCloud Drive, Desktop and Documents – as sidebar items in their own right, classified under iCloud. Once handed over to iCloud, these are now your only normal means (in the Finder) of accessing your Desktop and Documents folders. Unfortunately, macOS does not incorporate your Desktop and Documents folders into its folder hierarchy in ~/Library/Mobile Documents, and the behaviour of Finder windows and GUI interfaces such as the Open File dialog are extremely confusing. In Finder windows, you will find ~/Documents in the special iCloud item Documents and in the iCloud Drive item, but not in your Home folder unless you opt to display hidden files, when the Documents folder does appear in your Home folder as if nothing had happened. The same applies to ~/Desktop. in your Home folder as Documents (normally hidden). Desktop behaves similarly, although no alias is made to it in iCloud Drive. In the file system (e.g. FileManager calls), and in Terminal, ~/Documents hasn’t moved at all, but can now contain iCloud stub files when items are evicted. These follow the stop/period suffix and .icloud extension as described above, and have exactly the same issues with access from apps and in Terminal. There is also a symbolic link (of all things) in ~/Library/Mobile Documents/com~apple~CloudDocs to the ~/Documents folder, but none to ~/Desktop. If the situation with plain iCloud Drive is confusing and tough to handle in shell commands, that with Desktop & Documents Folders seems impossible if a user continues to store most of their documents in their Documents folder. I’d be very interested to hear of solutions which work with this iCloud option, and cope with evicted items, stub files, and their naming system.